So-called ‘NATO barbed wire’ promising protection from migrants, burglars and animals was unveiled at a Trade Fair for Building and Energy in Vienna, but all was not as it seemed. 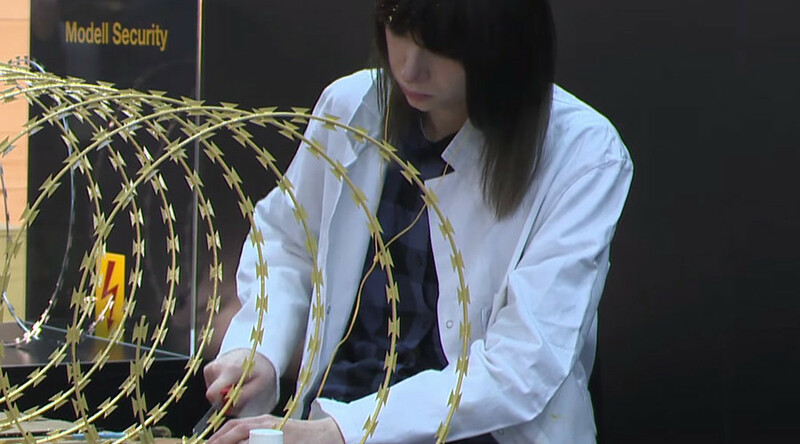 The shiny barbed wire displayed by ‘Happy Homes’ on Saturday promised to deliver both peace of mind and style, with two models of wire available. The standard ‘Schengen’ wire for €50 per meter, and the more luxurious, gold-plated ‘Secession’ line at €250 per meter. “You need to do that bit in secret, so that you don't get into conflict with the law,” he explained. “Especially if somebody is touching it, a fatality could occur. In this case, you need to take care of the difficulties yourself." Trade show attendees were asked to comment on the new product, with some appearing open to the idea. Peter need not have worried, as the barbed wire display is, in fact, an elaborate social experiment created by actors wishing to gauge people’s reaction to the imagined product. Tappler, who posed as the Happy Home representative is an actor from the Austrian theater group Stahlglatt & Blumeenweich, who even created a website as part of the performance. "We are doing this, because we want to continue the discourse about security-technology and the calls for higher security,” he explained. “We want to find out how visitors of this exhibition react to such offer. This offer is absolutely fictitious. The offer in reality does not exist. But if somebody really wants to have it, we will do it."